"Raven Ridge" is the codename AMD has bestowed on their "Zen+"-architecture based APUs from the Ryzen 2000 series. APUs (Accelerated Processing Unit) are processors with significantly greater graphics processing power. The processor concept was developed under the AMD Fusion brand name and was was originally designed for use in netbooks, fortunately for consumers however desktop APUs also happen to be ideal for low-budget gaming systems and compact multimedia PCs. "Raven Ridge" combines a Ryzen processor with a GPU based on the "Vega" architecture to make for an impressively powerful piece of kit. In terms of the socket used, in this instance AMD has opted to retain the AM4 format as used for standard Ryzen CPUs to enable them to be used on the same motherboards. When compared to earlier APUs, "Raven Ridge" optimisations in the areas of performance, efficiency as well as heat all combine to make it highly competitive in the arena of products with integrated GPUs. Includes AMD Wraith Stealth CPU cooler! The AMD Ryzen 5 2400G is a "Raven Ridge"-generation processor with four physical cores and multi-threading to make eight virtual cores. This quad-core processor functions at a frequency of 3.6 GHz per core and is capable of utilising Precision Boost to adjust clock frequencies in real-time in 25 MHz increments, while remaining within TDP, up to a speed of 3.9 GHz. The silicon is created using the advanced 14 nm FinFET manufacturing process with stacked transistors (also called 3D transistors). The drastic reduction in scale frees up more space on the processor die, and this enables the integration of a total of 2 MB Level 2 Cache and 4 MB Level 3 Cache in addition to the powerful Vega 11 GPU with 704 Shaders in 11 Compute Units (CUs). 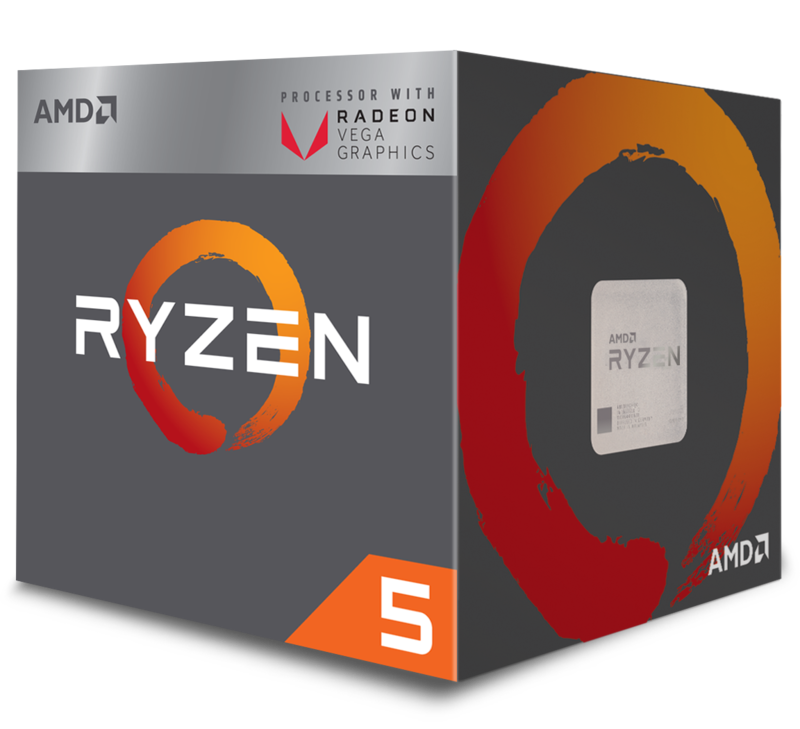 The AMD Ryzen 5 2400G is equipped with automatic Extended Frequency Range (XFR) overclocking that raises the maximum boost clock of the processor as long as the CPU remains within thermal limits and sufficient cooling is provided. As soon as the integrated CPU sensors detect additional cooling overhead, the Ryzen CPU adjusts its clock frequencies independently in accordance with the respective cooling solution provided. The AMD Ryzen APU also comes with an unlocked multiplier for manual overclocking. The unique feature offered by the "Raven Ridge" series of APUs is the integrated Vega-based GPU architecture. This is possible thanks to the fusion of 2017's "Zen+"-based processors with GPUs based on Vega architecture to create an efficient as well as powerful APU. In addition to many optimisations compared to older AMD GPUs, Vega was introduced with four new features: a High Bandwidth Cache Controller (HBCC), Rapid Packed Math (RPM) the Next-Gen Compute Units (NCU), a New Programmable Geometry Pipeline as well as an Enhanced Pixel Engine. The AMD Ryzen 5 2400G APU is equipped with the Vega 11 GPU. In this version the GPU comes with eleven Compute Units and a total of 704 shaders. The GPU Base Clock is set at 1250 MHz. The Ryzen APU supports fast DDR4 RAM up to 2933 MHz and the integrated GPU in particular benefits from this design decision. The combination of "Zen"-CPU architecture and "Vega" GPU architecture also results in a low Thermal Design Power (TDP) of just 65 Watts. Note: This is the boxed version including an AMD Wraith Stealth CPU cooler. The use of an AMD Ryzen APU requires an AM4 motherboard. Attention: Motherboards using the X370, B350 and A320 chipsets may require a BIOS update to be carried out in order to operate a Ryzen 2000 series CPU/APU! Affected motherboards with older BIOS versions may otherwise not work with a Ryzen 2000 CPU/APU. Factory compatible motherboards can be identified by a sticker bearing the inscription "AMD Ryzen Desktop 2000 Ready". Due to mixed stock supplied, we cannot guarantee that an AM4 motherboard is factory compatible with the Ryzen APUs. More links for "**B Grade** Ryzen 5 2400G VEGA Graphics AM4 CPU w/ Wraith Stealth Cooler"